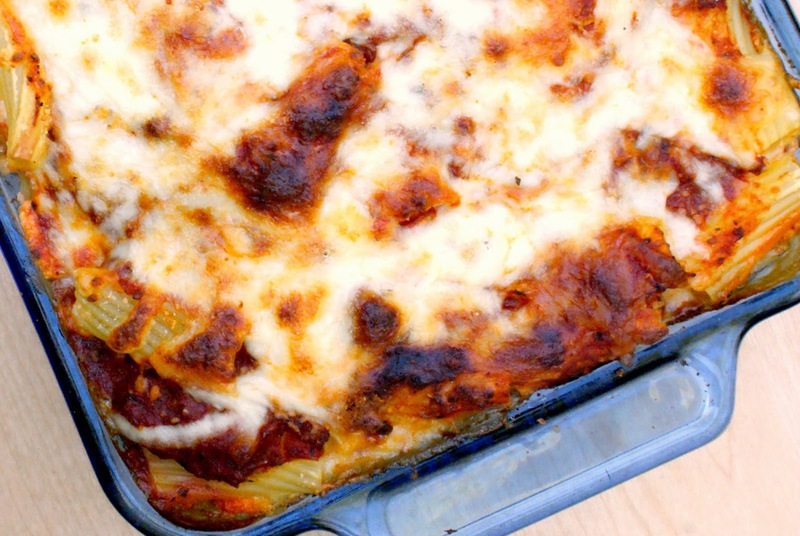 Cheesy Baked Rigatoni is an Italian casserole layered with rigatoni pasta, creamy ricotta cheese, flavorful sauce and melty mozzarella that is budget-friendly and easy to prepare. When I was at the store the other day, I saw the pasta on sale and decided to buy a few boxes. I know pasta's not expensive without a sale, but I'm cheap. I like a deal. My husband is a spaghetti kind of man, but I kind of felt like I needed a change from the norm. 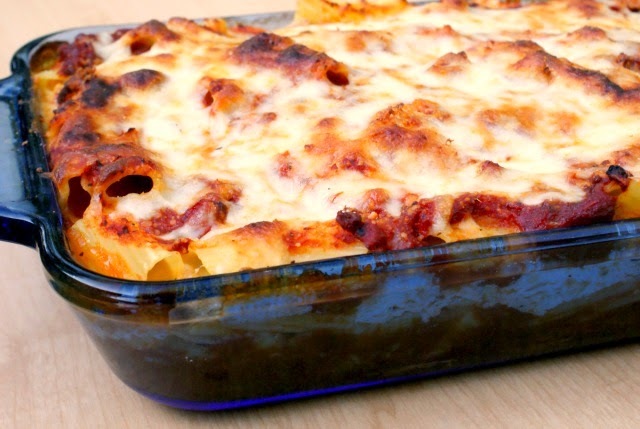 I saw the rigatoni and immediately thought of making this casserole. Sure, I could have picked the usual ziti that's typically used for this type of dish, but like I said, I was feeling like mixing it up a little. I envisioned layers of creamy ricotta and gooey stringy mozzarella all mingling with my grandmother's spaghetti sauce (that I just happened to have in the freezer). It was all over right there in the store. I was making this and I was going to love it. And boy, did I. And so did my husband. And so did the kids. Win, win, win. Best part? Plenty of leftovers for our family of four! So, make this for your family and enjoy the leftovers, or make it for a crowd! Preheat your oven to 375. Bring a large pot of salted water to a boil and cook the rigatoni according to the package directions. Drain. In a medium bowl, combine the ricotta, 1 cup of the mozzarella cheese, a pinch of salt and pepper, and the garlic powder. Spread 2 cups of the sauce in the bottom of a 9 x 13 glass baking dish. Spread half of the rigatoni over the sauce. Carefully spread the ricotta mixture over the rigatoni. Spread 1 cup of sauce over the ricotta. Sprinkle half of the remaining cheese over the sauce. Finish layering with the remaining rigatoni, topped with another cup of sauce, and finish with the remaining mozzarella cheese. Bake in the preheated oven for 25 minutes or until golden and bubbly. If you like your casseroles extra saucy, add a little extra sauce. If you like it super duper cheesy, add a little more cheese. Whatever you like! These measurements were perfect for us. This is now pinned on my Pinterest board "Recipes to Try" ! Wow - it really looks yummy!